Full control of iPod using factory radio and steering wheel controls. Text on factory radio displays iPod's browsing menus, song, artist, and elapsed time. Browse by artist, playlist, genre, and album. Controls include track forward, track back, fast forward, rewind, shuffle and repeat. 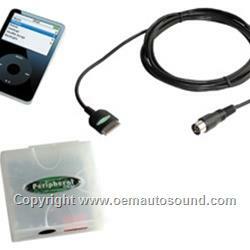 Audio feed directly into the factory radio to retain digital sound quality. Works with Nano, Photo, Mini, Gen3, Gen4, and Gen5 iPod's. Radio must be can bus ready, satellite ready or have Mp3 printed on the face of the radio. Interface is not compatible with factory satellite or rear seat entertainment systems. If either of these option are installed, they must be.